An estimated 4,000 tons of garbage are sitting in Songdo International City, Incheon, pending lawsuits, after a separate case in which a container full of plastic waste was found to have been illegally exported to the Philippines. According to the Incheon Free Economic Zone Authority, the 4,000-ton heap of waste, including plastic and wood, has been left on an around 7,900-square-meter site owned by the Incheon Port Authority. A waste exporter had planned to export the waste to Vietnam and kept it there under a contract to store cargo with a logistics firm that had rented the site in around July last year. The logistics firm gave permission to bring the waste to the site after confirming that it had been compressed and sorted through a recycling process. About a month later, however, plastic waste and pieces of wood were found mixed in the waste. The logistics company claimed that the exporter had brought in waste that is legally unfit for exports. It refused to receive more waste and terminated the contract with the waste exporter. The logistics firm has sued the exporter for violation of the waste control act. “Only a part of the waste sitting on the site had been recycled,” an official at the logistics firms said. The Incheon FEZ Authority received a civil complaint about the waste in August last year. It imposed a fine of 3 million won ($2,680) on the waste exporter and ordered it to remove the waste from the site. The waste exporter filed for an administrative trial, claiming that the FEZ Authority arbitrarily determined that the waste could not be exported. An administrative trial will be held around Jan. 28 to determine whether the FEZ Authority’s administrative action will be canceled. The exporter claims there is nothing illegal about leaving the garbage on Songdo. If the waste is declared legally unfit for export, and the exporter continues to leave it there, the responsibility for the waste would fall on the Incheon Port Authority, which owns the site, according to an official at the FEZ Authority. Recently, some 5,100 tons of garbage, including used diapers, batteries, light bulbs and electronics, were found to have been illegally exported to the Philippines in July 2018. 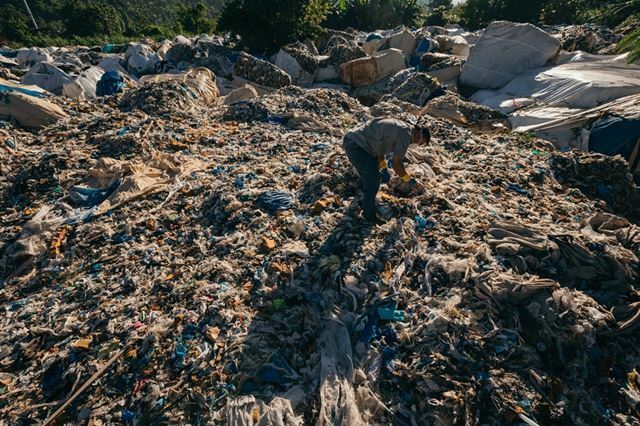 A joint venture of companies in Korea and the Philippines, which runs a waste recycling facility in the Southeast Asian country, had reported it as recyclable “plastic synthetic fakes,” but apparently, the waste had not been sorted or compressed. The news led to a number of Korean garbage exporters dumping waste across the country.